Mike Roussel brings together in this book a fascinating record of the British Pacific Fleet during the Second World War, in particular the closing years of conflict with Japan and the cruel fate meted out on the Palembang Nine after surrender on VJ Day. A rare reunion of Second World War veterans from the Fleet Air Arm took place at the book launch of Palembang and Beyond, held at The Museum of Army Flying – rare because of the great age reached by these veterans, who are now all in their late nineties. They were young during the war, aged eighteen to twenty, and their active service took place during the early years of the RAF, which was newly formed in April 1918. 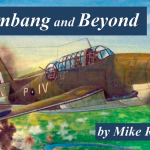 Their stories are told within Palembang and Beyond, a new book by shipping and aviation author, Mike Roussel. 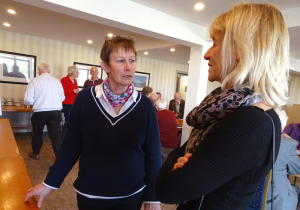 The book launch was supported by a large group of guests who came from as far afield as Devon. 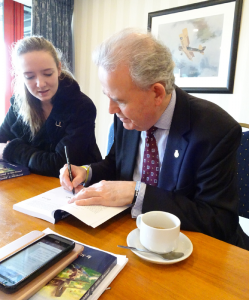 The Rt Hon Dr Julian Lewis MP, who wrote the foreword for the book, also attended. He explained how his interest in military history and a chance conversation with Mike Roussel had triggered the writing of this book about the Pacific War. Mike Roussel spoke at the launch about how he had ‘discovered as it were by accident, three gentlemen who were air crew with Fleet Air Arm 849 Squadron’. In writing the book, Mike travelled to interview Arthur Page, Norman ‘Dickie’ Richardson and John ‘Buster’ Brown, all of whom had all flown in the bombing raids on the Palembang oil refineries. He also heard from them about their fellow airmen who never came home from the war, among them the captured air crew known as the Palembang Nine who were cruelly executed by the Japanese after the surrender on VJ Day. 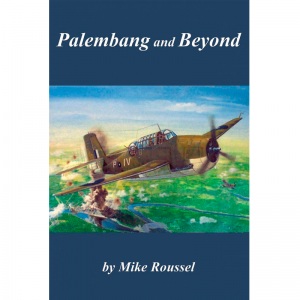 It took Mike just over a year to complete the research and writing of Palembang and Beyond. 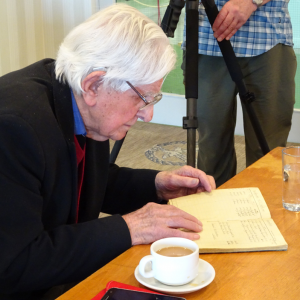 During that time he transcribed the veterans’ stories for inclusion in the book and gathered from them many of the 151 photographs that are published there for the first time. The photos give fascinating insights into the type of aircraft and the terrain over which the Fleet Air Arm fought, showing how challenging the air offensive was in the Pacific War. Attending the launch were veterans Dr Arthur Page, who was an Avenger pilot, and Norman ‘Dickie’ Richardson DSM, TAG (Telegraphist Air Gunner) who flew with Arthur. John ‘Buster’ Brown, who was also an Avenger pilot with 849 Squadron, lives in Yorkshire and was unable to come the distance. His brother, Michael Brown, represented him and brought his greetings and his wishes that he could have been there.